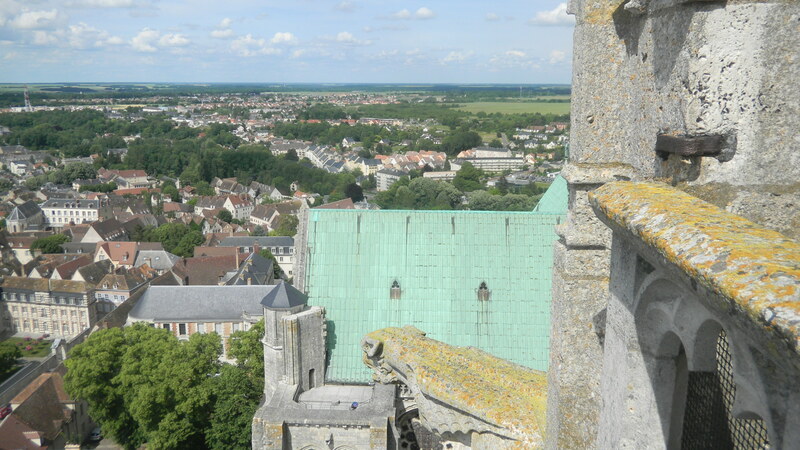 This blog has flown a to few places since the Part Three post on Chartres, but I want to take global cultural studies to new heights. We can now take a new look at one of the most studied buildings in the West, and gain a deeper appreciation of it. 1. 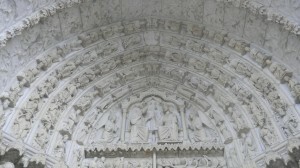 People in the 13th century associated the north side of the cathedral with the Old Testament. It’s the dark side of the building. The New Testament, which spreads the news of Christ and our salvation, is associated with the south. 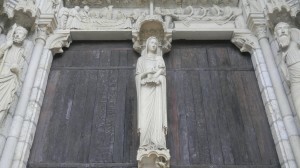 As in Chartres’ stained glass windows, Mary is a key link between both books. 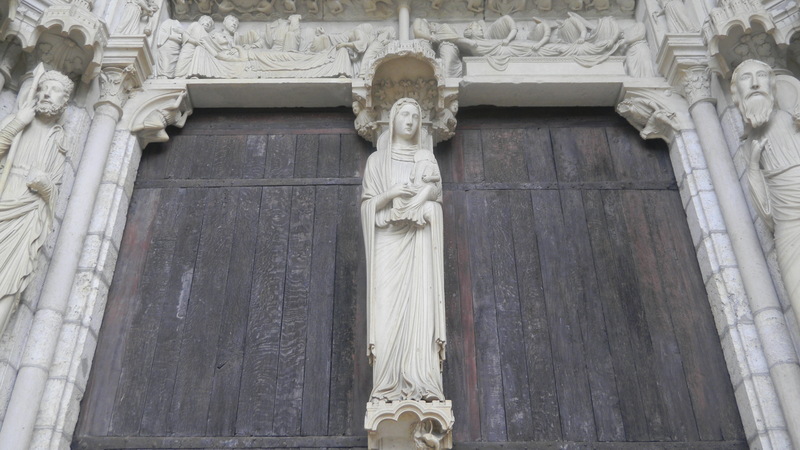 So the sculptural program and stained glass windows at Chartres complemented each other, and reinforced the new popularity of Mary’s cult. 2. New standards of realism, with an emphasis on flowing lines. 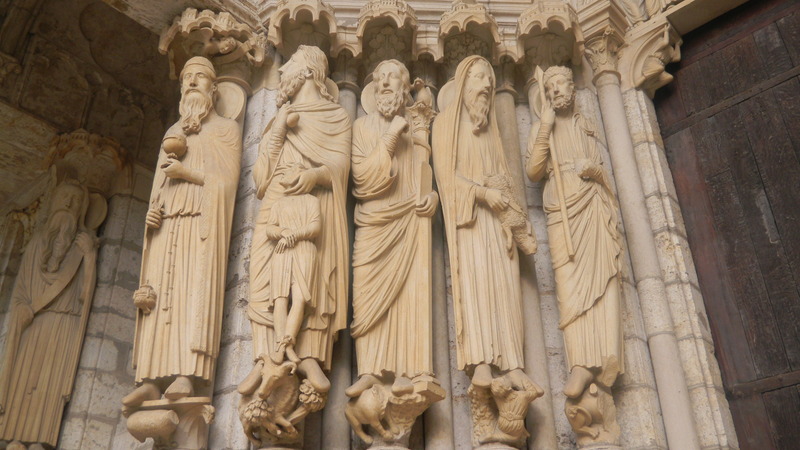 Though some of the figures are stick-like, as though their carvers hadn’t yet conceived them as free from the building’s columns and walls, they’re becoming more human than older figures, like those on St. Denis. 3. An emphasis on flowing lines. You can savor them in the gowns on the figures in all three of the above shots. Gothic grace. Instead of classical sculptures that embody proportion, and Italian renaissance sculptures that glorify the male body, you see forms that embody gentle flow. Thai art also has a lot of gracefully flowing lines, but Gothic art used them to represent people and stories from the Bible. They made Christian stories and theology more appealing for common people in medieval Europe’s growing cities. 4. Logic and clarity. Above is a more full perspective of the first shot. 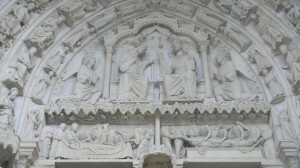 A hierarchy of different beings surrounds Mary’s Coronation. All the levels are clearly defined. Gothic cathedrals represented a total view if the universe, and its domains are clearly demarcated. We can note several cool differences from the Khmer temples which the last few posts explored, and they indicate what makes the West unique. 2. Linearity. The north side of the church prefigures the south, as the Old Testament presages the New Testament. 3. Clarity. 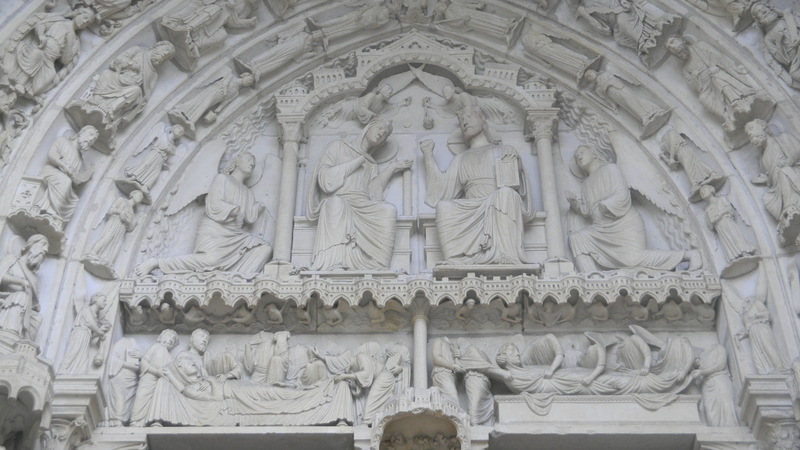 All worshipers at Chartres could see all sculptures and stained glass windows portraying the key events in the universe’s history. You can’t do this at the largest Khmer temples, including Ta Prohm and Preah Khan. Their multiple systems of enclosing walls, narrow corridors and insular courtyards ensure that you only see a small percentage of the whole. Their enormous sizes are spellbinding, but they keep interconnections between all the domains mysterious. The halls around the central shrine at Ta Prohm and Preah Khan are much narrower than a Gothic cathedral’s nave. 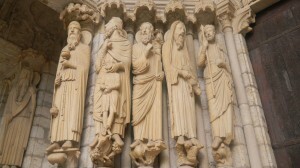 Gothic cathedrals integrated all the Bible’s characters and events into a universal history that everyone in Europe’s growing towns could see and understand. The Khmers integrated a gloriously diverse range of faiths (Mahayana Buddhism, Shiva worship, Vishnu worship, royal cults and local spirit cults), but with less of a clear conceptual framework that everyone shared. They were all linked to the king’s absolute power, and integrated in rituals that elite priests conducted. But the elites don’t seem to have been as concerned with providing everyone with a common intellectual framework. 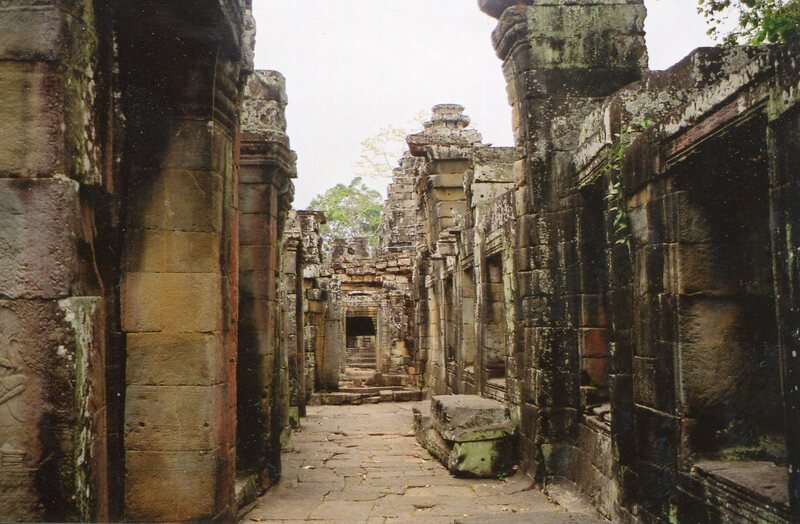 They dazzled them with ceremonies–and they were very dazzling, as you can see in the royal palace at Angkor. 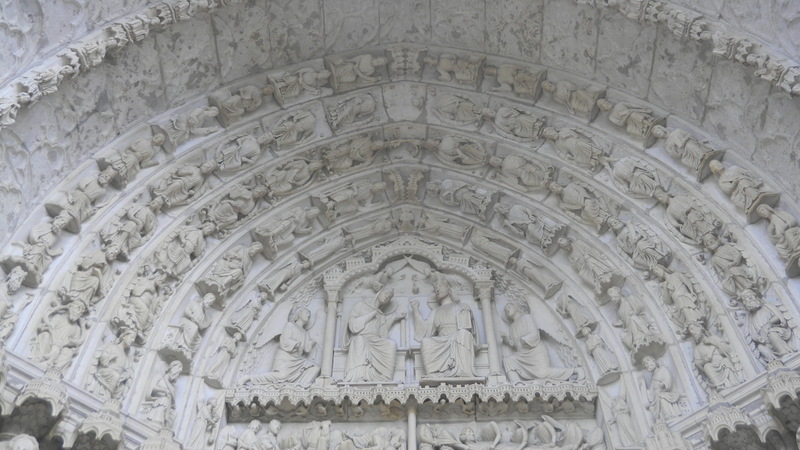 Gothic cathedrals linked domains in the universe with linearity and Jesus. Large Khmer temples linked them with the king, his association with whatever gods he chose to honor, and sensational art and rituals. 4. The vertical dimension. I find this to be the coolest thing about Gothic cathedrals. They’re more than twice as high as the largest Khmer temples (and many times higher than Ta Prohm and Preah Khan). Gothic cathedrals represent a realistic and logical view of the whole universe, and at the same time, soar to the heavens to transcend the world that they portray. 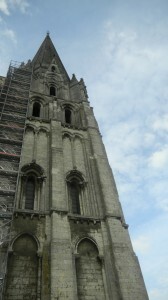 Like Indian temples, Gothic cathedrals can be approached from different levels. In Gothic cathedrals, there’s the linear and categorized world, and an attempt to rise above it. 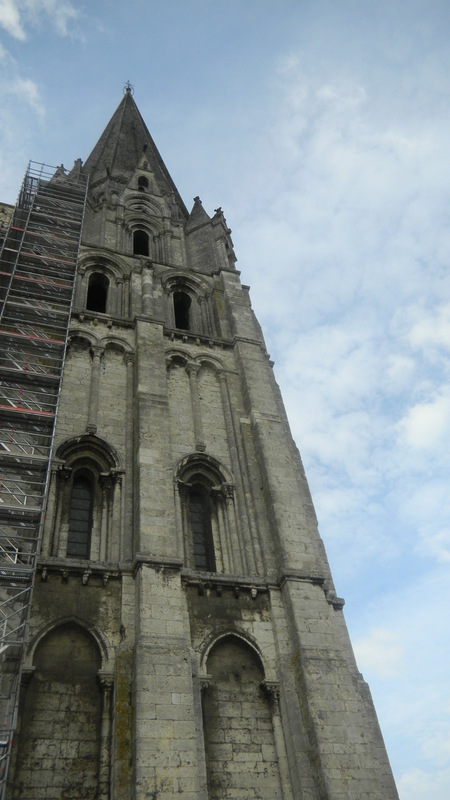 Because Gothic cathedrals appeal to different mentalities, every generation can find new meanings in them. They still attract millions of people in today’s digital world. You can take global cultural studies to even greater heights by exploring an Indian temple that was built in the 13th century.